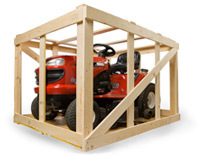 Pak Mail of Jonesboro offers innovative solutions for specialty freight challenges. We pack, crate, and ship, art, machinery, antiques, furniture, and equipment all over the world. Our specialists will provide consultation on the most efficient, time-sensitive, and cost-effective manner to pack and ship your specialty freight worldwide.